It’s no secret that successful racers rely on data acquisition systems to give them the winning edge, but until now they have been too expensive for the average racer. 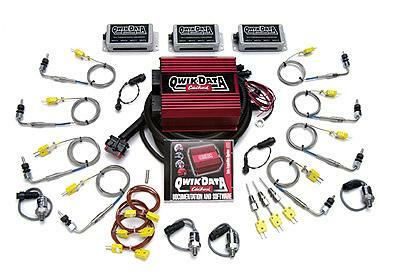 From pro class competitors to weekend warriors, Edelbrock’s QwikData™ data acquisition systems offer all of the benefits of a higher priced unit at a fraction of the cost. All QwikData™ Systems feature a 32-bit Motorola processor, 1-mb of non-volatile memory, real-time display, rpm and voltage input, fully assembled wiring harness, analysis software, user’s manual, and internet upgrade download capability. Adjustable High-Speed Data Logging: With the ability of sampling data at extremely high rates, QwikData™ outperforms the competition. Data samplerates are adjustable, up to 500 samples per second. Up To 30 Data Input Channels: The basic unit comes equipped with 8 analog inputs and 6 digital inputs. The advanced unit has 24 analog input channels and 6 digital inputs. The digital inputs can record on/off events, frequency (such as mph, rpm and digital mass air flow sensor), or duty cycle (such as fuel injectors and turbo boost controller). Windows® Interface: The computer software provided is simple and intuitive to use. An IBM-based 486 (or better) laptop computer capable of running Windows® 3.1 (or later) or 98SE, NT, 2000, XP software is required for data analysis. The entire system can be configured from menus using a mouse. No complicated programming is required. Sophisticated Data Analysis: Trend graphs of 8 user selectable input channels against time or distance. Large Data Storage Capacity: QwikData™ provides 1 MB of non-volatile memory, much more than most other systems, and requires no power to retain data. Multiple Lap/Run Comparison: Runs or laps can be stored and overlaid. Real Time Display: Use for monitoring engine during warm-up, in dyno sessions and troubleshooting with a PC connected; or for real time telemetry via radio modem in circle track/road racing applications. Internet Upgrades: The software embedded in the QwikData™ unit is stored in a chip (FLASH EPROM) and can be updated easily from the Edelbrock web site at www.edelbrock.com. Fully Assembled Wiring Harness: Pre-installed connectors provided. Each sensor is supplied with the appropriate mating connector for quick and easy installation. Durable Construction: Features include laser-cut end plates with gaskets, anodized aluminum enclosure, and high-quality silicone sealed connectors. Internal Accelerometers: Measure longitudinal and lateral acceleration. Expandability: Add more sensors for additional parameters.